Why should the gladiators be the only ones having fun, why not let the goddesses play too. We think your toes will feel right at home in these edgy sandals that are worthy of a celestial being....seen above in tan. 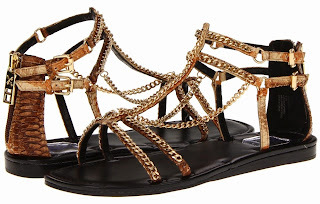 We can't help but love the chain details over the leather multi-straps of this DMSX Donald J Pliner Carri Sandals. We love its double straps across the toes and the double ankle strap enclosure with side buckles, comfortable 1/2" heel, back-zip closure with adjustable buckles and it's amazing 29.99 on 6pm.com. For those who might want a different color, it also comes in black (with gold chains) and white (with silver chains) - both eye-catching, although we're partial to the white and silver.